J & F Construction Co., Inc.
Metropolitan Paint and Home Improvement, Inc. Structural Repair & Renovations, Inc.
D and D Lawn Service, Inc. Comment: Various cracks in brick exterior wall of townhouse. Comment: We have very soft bricks in our living room. They are absorbing water from the chimney and efflorescence is coming out of the brick. With very windy and heavy rains, water comes down the chimney. We would like to fix the water issue and clean the bricks. Comment: It's not a big project, and pretty basic. It's an area just below my deck. The area is 18' by 15' with a few cutouts (i.e. 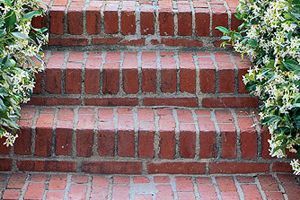 less sq footage) for some steps up the deck and then in another area down to a basement. I can send pics if needed. Looking for some kinds of gray/brown pavers. Falls Church Brick & Stone Masonry Contractors are rated 4.59 out of 5 based on 1,084 reviews of 28 pros. Not Looking for Brick & Stone Contractors in Falls Church, VA?